Joe Cirrito runs, then runs some more. And more after that. 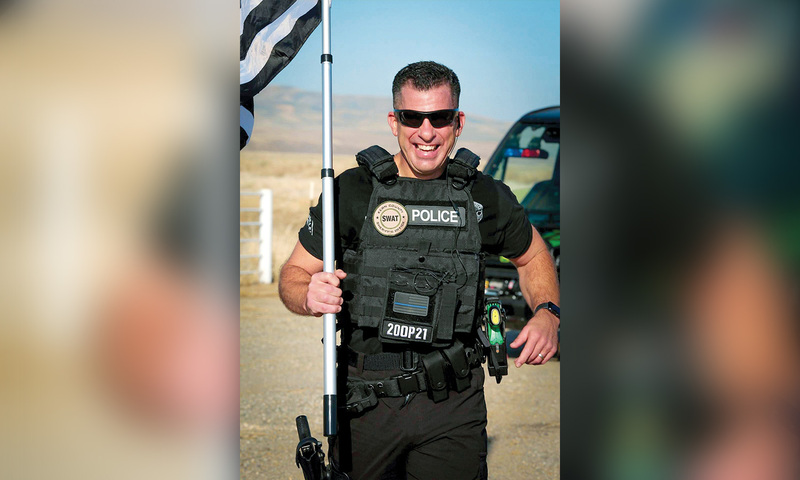 The 49-year-old Los Angeles police officer runs gut-wrenching, vomit-inducing, muscle-depleting distances: the 26.2 miles of the L.A. Marathon, the 100 miles from Bakersfield to Los Angeles and a 420-mile run from Los Angeles to Sacramento, all in full tactical gear — vest, duty belt, weapon, radio, boots. An argument can be offered as to the strength of his character, but he won’t allow that. Yet his runs are about character — the character of the fallen officers he runs for. Unfortunately, there are many of those, but for Joe there is one in particular who has guided him through an amazing journey that began years ago, in a different time, a different place and a different career. On September 11, 2001, Joe was in a new teaching position in a Los Angeles public school. As he watched the Towers fall from 3,000 miles away, he immediately knew that his friend Dominick Pezzulo, a 36-year-old Port Authority of New York and New Jersey police officer with only 13 months on the job, was gone. No one had to tell Joe; no official notification needed to be read; no phone call needed to be received. He knew Dominick’s character and selflessness had only one outcome: the death of a hero. 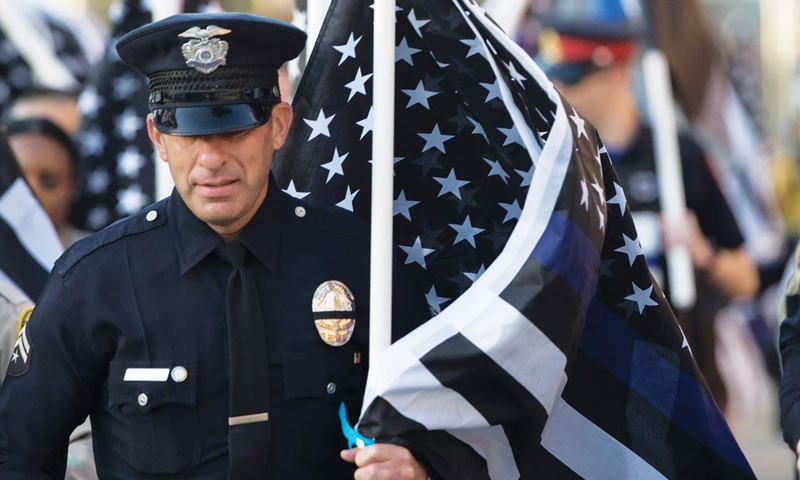 Now, Joe is a 14-year veteran of the Los Angeles Police Department. He came to the LAPD by way of Lehman High School in the Bronx, New York, where he and Dominick were both special education teachers in the 1990s. Joe recalls Dominick, a graduate of Lehman, standing as a sentinel providing an overwatch as the students navigated the halls. “He walked with a swagger; a big, buff guy. The kids loved him,” Joe says. Dominick’s good looks, athleticism and street smarts were the type of things inner-city kids from the Bronx understood and gravitated toward. Dominick also taught industrial arts (shop), showing some tough kids how to work on cars and fix things, teaching them a trade. One day, Joe and Dominick found themselves in a Lehman girls’ bathroom, struggling to revive a young student who had hanged herself. Sadly, they came to the realization that she could not be saved. But the experience evolved into a friendship, which would help Joe through the difficulties of a failing marriage. He says it was Dominick’s concern and understanding that pulled him through. At the same time, Dominick had his sights on a career in law enforcement, which Joe confided that he had also considered. From that point on, Dominick would encourage Joe to take tests and pursue his desires. Eventually, Dominick left teaching to become a Port Authority police officer, a move that left Joe questioning the strength of his commitment to repair his life. What remained, however, was his admiration of Dominick’s strength to move on. Joe’s personal life led him to leave Lehman as well, heading to California to follow his now-estranged wife and his children. It was a move he felt he had to make to remain an involved and dedicated father. He eventually gained joint custody of his children and found work as a Los Angeles public school teacher. While putting his West Coast life together, Joe began testing for the LAPD, though he was still not committed — that is, not until the morning of September 11, 2001. Watching the attacks unfold on TV, Joe knew intuitively that Dominick was dead. He knew that Dominick would be there — it was who he was. He would have seen it as his job to get to the Trade Center and rescue everyone he could. Dominick began that day in Midtown Manhattan, assigned to the Port Authority Police Department’s Port Authority Bus Terminal Command, a gritty, street-crime patrol. Soon after an American Airlines Boeing 767 aircraft crashed into the north tower of the World Trade Center, he and a handful of other cops commandeered a Metropolitan Transportation Authority bus and directed it downtown to the site. Dominick was buried in the collapse of the first tower. Two of his partners were killed and two others were trapped. Dominick was still alive, trying to free Sergeant John McLoughlin and Police Officer Will Jimeno, when the second tower collapsed, fatally injuring him. His final words were to Jimeno: “Will, don’t forget that I died trying to save you guys.” Dominick drew his service weapon and fired one round into a hole that sunlight had penetrated, hoping to get someone’s attention. He then slumped over and died. Dominick’s final hours would later be reenacted on the big screen in Oliver Stone’s movie World Trade Center. Joe’s guilt was powerful. “I should have been with him; I should have followed him. I could have done this, but I didn’t take the next step,” he remembers thinking. It wasn’t long before the LAPD called, and Joe went. At 35, he was the oldest recruit in his academy class. It didn’t matter to him — he could no longer put off what was to become his calling. Running in honor of the fallen has become a healing process for him. He believes we all have abilities that could help others heal. In one interview about why he runs, Joe simply said, “I can run. I can’t sing, but I can run.” That simple statement shows his determination. Joe is not superhuman; he is just a cop — a dedicated, committed cop no different than any other of our nation’s law enforcement officers. But a look into his eyes exposes a penetrating, steely reserve, a resolve to make sure we never forget our fallen law enforcement heroes. Those same eyes also well with emotion when he speaks of those who are now gone. He is unashamed of the tears that fall when he talks about his friend Dominick. 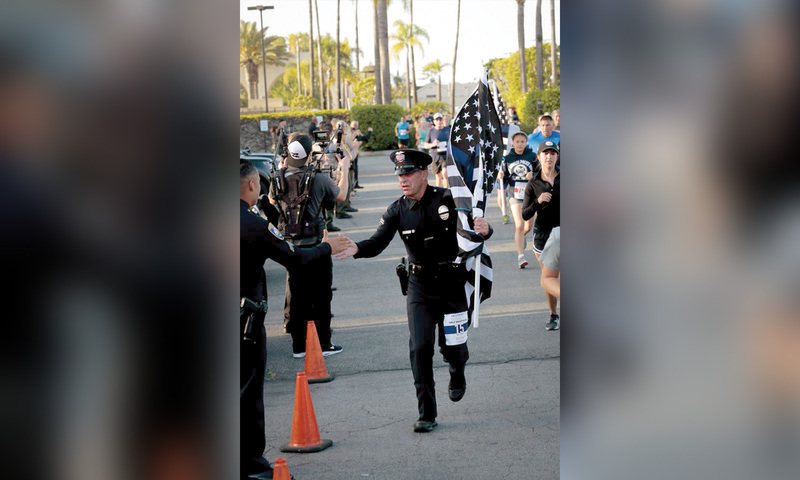 Joe’s first long-distance run was the 2011 Los Angeles Marathon, but his first run to honor the fallen was the 2016 Run to Remember LA, a half-marathon organized as a tribute to all law enforcement, fire service, military and first responder personnel. This was Joe’s first run in uniform and full tactical gear, and he ran it in honor of Dominick. Joe soon worked his way up to even more noteworthy runs. 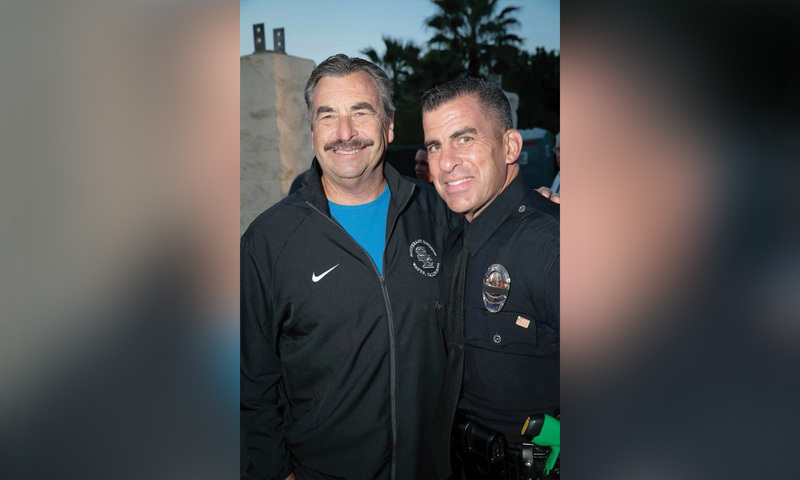 His early morning training included a circuitous route in the parking lot at LAPD Olympic Station, where he was a senior lead officer before recently becoming a K-9 officer assigned to the Gangs and Narcotics K-9 Bloodhound Unit. In March 2018, Joe set out on a 100-mile run from Bakersfield, California, to the LAPD Memorial at police headquarters to commemorate the death of Los Angeles Police Officer Ian Campbell, who was shot and killed on March 9, 1963, in an onion field in Bakersfield. Campbell’s death was chronicled by Joseph Wambaugh, an LAPD sergeant, in his 1973 bestselling book, The Onion Field. Joe began his run by scooping a handful of onion field dirt into a plastic bag, which he carried all the way to Los Angeles and sprinkled around the LAPD Memorial. The run raised $5,000 to sponsor local youth to participate in the Run to Remember in April 2018. It also raised funds to help repair the LAPD Memorial. 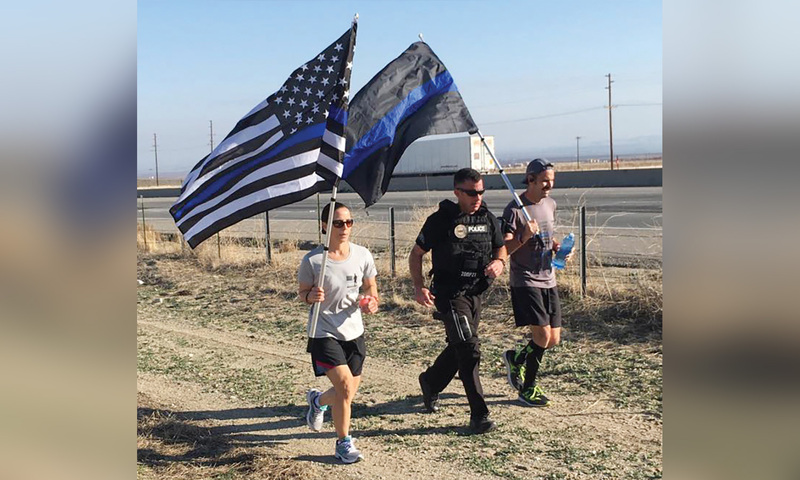 Joe’s longest run began on November 27, 2016, when he and LAPD Metropolitan Division Officer Christina Tudor, who is also an officer in the California Army National Guard, ran from the Los Angeles Police Academy to the California Peace Officers’ Memorial in Sacramento. The 420-mile, 12-day run, known as Project Endure, was sponsored by the nonprofit organization Bluecoat Music, which raises awareness of fallen officers and supports the families they left behind. The funds they raised were donated to Concerns of Police Survivors (C.O.P.S.) and the Los Angeles Police Memorial Foundation. During the Project Endure run, late at night, somewhere in Madera County, Joe’s urine turned brown. “My kidneys were in bad shape,” he says. “My body was collapsing and my brain was negative; I needed to stop. I had bad muscle cramps. I was totally deteriorated. I remember looking up and thinking about quitting and walking. Then a shadow was next to me — it’s Dominick and he’s moving off my left shoulder.” He says he felt an enormous amount of power and strength, and thought, “Dom is with me; I’m good.” Joe completed his odyssey, and he believes it was because Dominick was watching over him. And so, Joe, now remarried and the father of three, continues in his new assignment with his new partner, K-9 Hope. He is as positive as ever and looks forward to this next chapter in his career, saying, “My dog will do great things. We’re going to help a lot of people.” With the support of his family, Hope by his side and Dominick watching over him, Joe is certain to make good on that claim. Bobby Egbert is a retired Port Authority of New York and New Jersey police officer, having served for 27 years. He is currently the public information officer of the Port Authority Police Benevolent Association, the union representing Port Authority police officers. He is also a 9/11 World Trade Center first responder veteran.